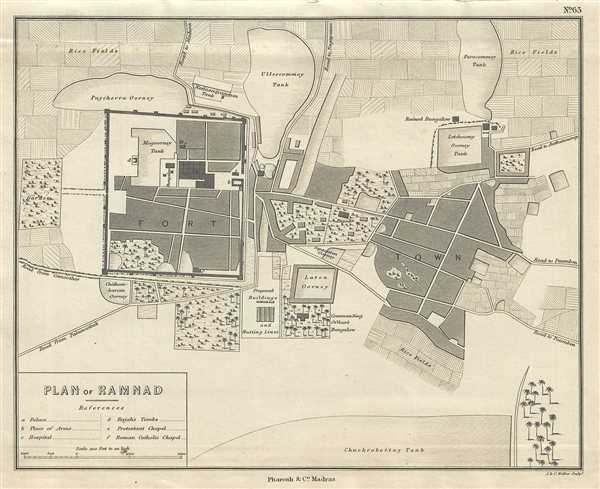 Plan of the town of Ramnad a town near the important Hindu and Muslim pilgrimage centers in southern India. This is a lovely 1854 Pharoah and Company map of the town of Ramnad or Ramanathapuram in the Indian state of Tamil Nadu. Beautifully rendered, the map notes the fort, tanks, rice fields, official buildings, ruins, and other important landmarks from the period. A reference table in the lower left quadrant lists the locations marked within the fort complex, including the Raja’s palace. Ramnad is close to important Hindu and Muslim pilgrimage centers (Rameswaram, Devipattinam and the Ervadi dargah). The Raja’s Palace is still popular tourist attraction, Although no longer in power, the Raja and his family still occupy the palace. This map was engraved by J. and C. Walker and issued as plate no. 63 by Pharoah and Company in their 1854 Atlas of Southern India. J. B. Pharoah (fl. c. 1838 – 1869) was a Madras, India, based bookseller and publisher of educational books and map active in the middle of the 19th century. He maintained a bookshop on Mount Road. The form was a general emporium for European published work. They also published a weekly English language newspaper called The Athenaeum and Statesman (in 1864 renamed, he Athenaeum and Daily News). They also published the The Madras Quarterly Medical Journal and The Madras Journal of Literature and Science. Little more is known of Pharoah. John Walker, Alexander Walker and Charles Walker, known collectively as J & C Walker (fl. 1820-95), were engravers, draughtsmen and publishers working through the 19th century. They had several offices 47 Bernard St Russel Sq (from 1830 - 1836), 3 Burleigh St Strand (from 1837 to 1840), 9 Castle St Holborn (from 1841 to 1847) and 37 Castle St Holborn (from 1848 to 1875). The firm is best known for its work in conjunction with the maps issued by the Society for the Diffusion of Useful Knowledge or, as it is more commonly known, the S.D.U.K. However, they also engraved a large corpus of work for the British Admiralty , as well as issuing several important maps of India and multiple issues of the Royal Atlas. Pharoah and Company, An Atlas of the Southern Part of India including Plans of all the Principal Towns and Cantonments, reduced from the Grand Trigonometrical Survey of India shewing also The Tenasserim Provinces, (Madras) 1854. The Pharoah and Company Atlas of Southern India was published around 1854. The medium format 4to atlas contained some 70 maps focusing on the southern part of Indian and the Tanasserium Province, or Burma. The atlas was engraved an printed in London by J. and C. Walker, but seems to have been issued only in Madras, India, by J. B. Pharoah and Company. The atlas claims to have been "reduced from the Grand Trigonometrical Survey of India," and, in fact the survey did provide a framework for the atlas, but little of the actual cartographic detail. The atlas is rather novel in that it has universal scale of 16 miles to the inch (1 : 1013760) for most of its regional maps. In addition to its regional maps, the atlas also contained 21city plans. These plans are some of the only obtainable mid-195h century maps of many South Indian cities. It also contained a rare map of Singapore.